Philip Roth said that reading was a way to keep the circuits open and to think about the piece he’s working on while getting a little rest from the actual work in hand. Sooooo, the question is….should I join a book club? I’ve been thinking about this for over a year now, but never actually done anything about it. “Mount Toobie” (sorry, slipping into BookCrosser mode there), my to be read pile is huge, verging on thousands, which is what has always put me off….but. My writing style is very similar to my reading preferences. I tend to read what I call “real life stuff”. No fantasy or sci-fi. I’m not even keen on crime either. I like emotional character driven stories, about people, their lives, and how they overcome obstacles. Which, is kinda what I write about. But does that allow me to grow as a writer? Am I missing out on the opportunity to “broaden my horizons” so to speak? Also, would joining a book club/reading group give me an insight to what readers want from their books? I do copy writing I like into my note book. I collect pieces that I think are powerful. I did at one stage start doing book reviews, but now I just use Goodreads. Are you a member of a reading group/book club? Do you feel your writing benefits from it? Whilst compiling this post an update email hit my inbox from Kitty Hietala’s blog which I found very interesting. 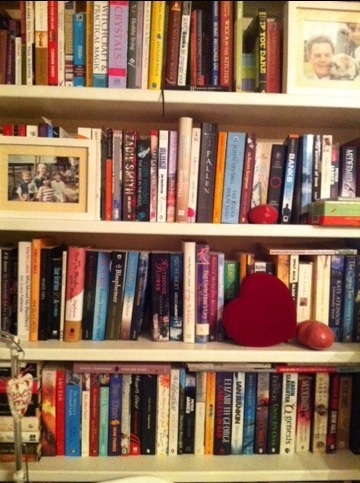 Here’s a pic of just one of my book shelves lol. This entry was tagged Bookcrossing, Creative writing, Fiction, GoodReads, Jack Heffron, Literature, Note Book, Online Writing, Philip Roth, Read, Reading Group, Short Stories, Short story, Writer Resources, Writers Notebook, Writers Resources, Writing, Writing Exercises, Writing Prompts. Bookmark the permalink. I love the bookcase. I have never been part of a book club. My wife was in for awhile but it was more of a group therapy meeting than a book club. She dropped out because she could not get people to talk about the books. Perhaps, if I do join one, find one that someone can recommend me. I always say I don’t have time to join one because I spend so much time writing. That said, I do think reading your genre can clarify what works and what doesn’t. Like you, I don’t like fantasy, paranormal, historical books (Although I love Ann Rice’s The Witching Hour.. go figure) Let me know if you find a book club that caters to the writing we both appear to like. I have a book they could read, lol, and soon I’ll have a second for them. Yeah, now that’s true, it’s not such a bad thing to stick to reading the genre you like to write is it. I’m not apart of a book club, but I try to read a lot. I’ll venture outside of romance to other things, but not too often. I can definitely see the merits of it though. Or maybe I should make myself read different genres. I’ve often heard that reading works best when you’re at a revising stage for your drafts, but there’s no harm in reading at all times, whenever it’s possible. Compare it to being a fighter, or a football player. If you want to beat that next person, that next team, that next challenge, you need to know how you’re going to face it. What tools do I need? Am I doing enough? Where am I falling short? What are my strengths and weaknesses? As I’ve found over the course of the last couple months, just the simple act of working in your writing with somebody else opens your horizon to a lot of ideas you never even considered, or perhaps you decided to ignore. I even blogged about it in “Mr. Big Hair, Bo Dicks”. Why not give it a try? Yeah, I can see that working. I’ve just read your post….brilliant! Hmm… Ya know, I’ve actually been searching recently for a local book club in my area, just to get out and meet more people. (Extreme introvert, here.) For the most part, though, I figure that if I really want to read something (and my wish list confirms there’s much I’d like/intend to read, lol) I’ll do it in my own time. I usually have specific reasons for picking out certain novels to read, too (fiction and non-fiction)…try to do double or triple duty, if I can, as far as learning new things and reading for enjoyment go. I do think that reading and writing go hand-in-hand, however, and can feed into each other…for better or for worse, heh. Yes, that is a very good reason to join a book club! Lol, don’t talk to me about wish lists, my Amazon one currently stands at about 700! And ’tis okay. I consider myself to be a slooooow reader, so the list grows about as quickly, heh. Yeah, I’m definitely a bit like that. At the moment I have 3 books on the go, but that’s been the case for about a month lol. I wish I had time to join a book club, but I understand it varies from person to person. I do try to challenge myself to read a variety of books; more so than I once did. It takes me some time to read through them, which is okay because a writer is meant to take in the story as a reader and enjoy it. I started out the year reading four books. Perhaps in the future hon. After having to read specified books for A levels, I couldn’t bear to have to read specific books again. It was such a chore and put me of reading for years. I’m still bookcrossing though. It’s nice to read a book and then know about it if someone mentions it, or to recommend it to someone else. More organic instead of forced.